Microsoft’s near term roadmap is to release two more feature updates every year. Version 1809 (Codenamed Redstone 5) is due later this year. The number and frequency of releases coupled with new servicing models has led to a lot of confusion in the industry around managing servicing branches, quality updates vs. feature updates and the cadence of the release cycle of Windows as a Service (WaaS). In this post I’d like to focus on two simple things you can do to simplify your windows 10 updates if you are using System Center Configuration Manager (SCCM). ADRs let you automate how, when and what software updates are applied to your systems using repeatable, template, scheduled business rules. There are many good posts on ADRs and some very good videos by Jason Sandys (A fellow MVP) so I’m going to focus on Filters. This filter reduces the number of updates in the update group from over 150 to just 4 items. A little bit more manageable. You may also notice that I have added the keyword “Malicious” to include the Malicious Software Removal Tool (MSRT) as I find it useful to include in my ADRs. You can use the search criteria in a similar way if you are creating software update groups manually. I use filters regularly to help organize my software update groups and create some order from the chaos that is Windows 10 updating. This entry was posted in Configuration Manager, Winodws 10. I’m writing this post while downloading 10. No, not the Bo Derek movie from the 1979 that I wasn’t allowed to watch. Windows 10. 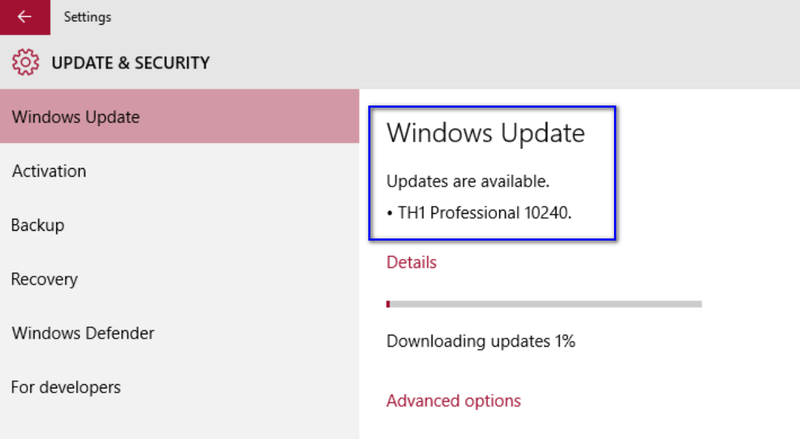 Yeah that’s right – Although not generally available until July 29th, Build 10240 has been approved as the final RTM build and it is available to Windows insiders on both the fast and slow rings as of today. So while I can write about the availability of Windows 10 I can’t give you a first-hand review of it until a little bit later. Continuum – This will be more interesting as the Windows 10 for mobile gets closer to RTM. I’m really looking forward to using my phone as a PC by connecting a Bluetooth keyboard and wireless display through Miracast. Tablet Mode – Really part of Continuum but great for users with tablets or hybrids. It reorganizes the UIO based on whether there is a keyboard attached or not. You can be working desktop mode and detach the keyboard and automagically the start menu converts to the start screen, hamburger menus appear and the entire interface makes itself more touch friendly. The Edge Browser – Aka project Spartan – This browser is fast. Faster than Chrome and will support extensions. IE is still available but I’m going to be using Edge as my goto browser. Universal Apps – Again we’ll have to wait and see how this plays out long term. I’m excited at the prospect of a flurry of developers writing apps for the billion or so Windows devices. Xbox Streaming – I hear you saying it sounds interesting but why would I ever want to stream my Xbox to my PC? Consider this scenario: You want to watch the big game or a special movie on the big screen with the surround sound and leather recliner but your kids want to play NHL2K15 and the Xbox is connected to the home theatre. Well, they can stream the game to a PC in another room and let you watch your game or movie in comfort. Windowed Modern/Metro Apps – That’s right they don’t HAVE to run full screen anymore unless you want them to. It makes multi-tasking much easier especially in a multi display environment. Virtual Desktops – This allows you to arrange apps or groups of Apps called, you guessed it, desktops how you like them and navigate between them. It’s like having multiple displays with apps organized to your liking just hidden until you need them. Let me know what you are most excited about in Windows 10 and if you’d like more information like this, please check out CanIT Pro where many more bloggers will be sharing their experiences with the best version of Windows to date. As part of the Windows 10 launch, Microsoft stores are holding special events, workshops and guest appearances . If you would like more information about these events, click here . This entry was posted in Windows, Winodws 10.